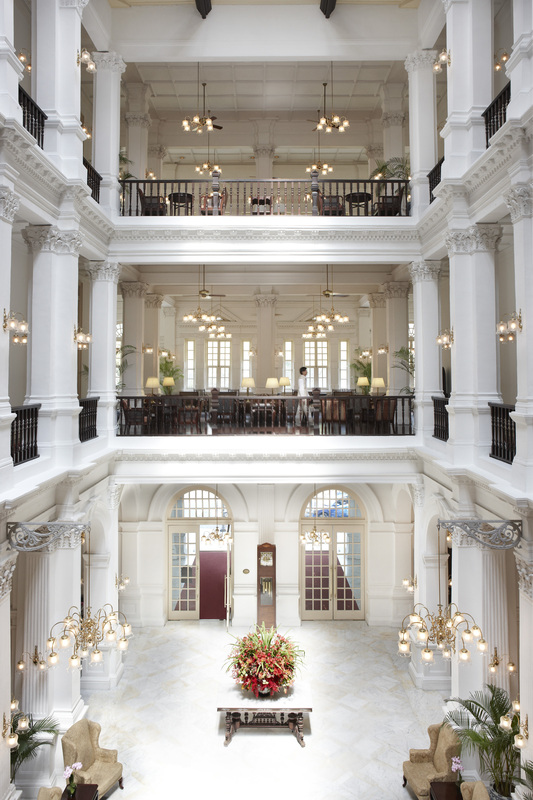 Raffles in Singapore had been on my dream list for years, based on movies and books. On my first visit to Singapore in 1989, my hopes were dashed, as it was closed for renovations. 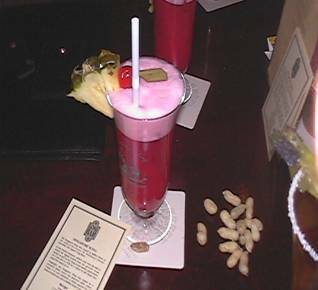 But all was forgiven when I returned in 2001 to enjoy its classic charm, attention to detail, wonderful history and naturally, a Singapore Sling. During our initial Singapore visit, not at Raffles, my husband and I spoke with the grandson of the bartender who allegedly invented the classic Singapore Sling. He proudly made our drinks (they were good) and later we enjoyed another back at the famous Long Bar at Raffles. We really couldn’t tell the difference, but the ambiance of the Long Bar, the glass, and Singapore Sling coaster made it more special at Raffles. 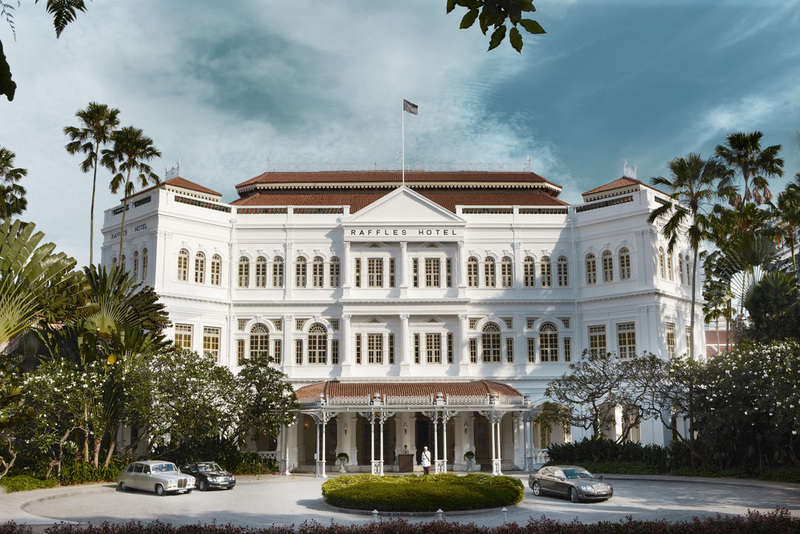 Raffles first opened in 1887 and has been immortalized by Somerset Maugham, Rudyard Kipling, Ernest Hemingway, and Alfred Hitchcock. My reading memories were more from Maugham and Hitchcock. Being quite luxurious for its time, this hotel is even more luxurious now and embodies the colonial history and ambiance. It’s simply romantic. We’ve stayed at four exceptional properties in Singapore, but none have the lure and pull of Raffles. Its 103 suites offer 24-hour butler service and every other amenity you can imagine. Beds are comfortable and suites are decorated to transport you to a different era. As much of a romantic and history lover as I am, I know I enjoy the comfort and amenities of the current Raffles over the earlier one. It seems to be the best of both worlds. Located in the financial area, Raffles is in a perfect spot for doing business, but its shopping arcade leaves you lacking for nothing. Naturally, the spa is a favorite and the hotel has fifteen restaurants. Among services offered, the hotel’s cooking school provides classes. They are great fun and I highly recommend the activity. Even though Raffles is a destination within itself, Singapore has a tremendous amount to offer that should not be missed. Make time for both. Because of my own wonderful experience with Raffles when I was evaluating it for an incentive program, I was delighted when I saw they were expanding its excellent standards of service by slowly adding properties in other countries. My next encounter was with Le Royal Monceau Raffles in Paris. Its outside is classic, but when you step inside this elegant old establishment, a complete transformation greets you. This hotel, the first Raffles location outside of Asia, certainly maintains the Raffles tradition of excellence. On Avenue Hoche, Le Royal Monceau is only a few blocks from the Arc de Triomphe and Parc Monceau. The lobby of Le Royal Monceau could be described as eclectic, blending old and new in a contemporary, welcoming and comforting atmosphere. Treasures of old-world Paris have not been discarded, just rearranged. Glorious crystal chandeliers cover the ceiling of its grand stairway, casting a spectacular glow. As you explore the hotel, there are many treasures to find, both new and old, which delight and intrigue—from a wall of small seashells to a collection of stick figure animals. Art is a major theme of the hotel. In addition to interesting works on display in its corridors and lobby, there is an exceptional art concierge, an outstanding art bookstore and a collection beyond one’s imagination. This assembly could be a museum in itself. There is also a gallery where different collections are exhibited. The hotel’s spa includes a 23-meter pool, the largest in any Paris hotel, and the onsite Katara Cinema is considered one of Europe’s finest screening theaters. For music aficionados, an acoustic guitar is in every room for guests’ enjoyment and guitar lessons are offered for those inclined to learn. Le Royal Monceau is home to La Cuisine, one Michelin star; Il Carpaccio, one Michelin star; and the Terrace Garden, where we sipped champagne that bubbled continuously for 20 minutes of heaven. Our dinner at La Cuisine was delicious and my interview with the executive chef quite interesting. Overall, this hotel embodies the spirit of Paris. Currently, in addition to Singapore and Paris, there are Raffles in Cambodia, China, Philippines, Saudi Arabia, Seychelles, and Dubai. In 2014, there will be two more added in Indonesia and Turkey. I know that each property will be totally unique, taking in the environment where it is located, while providing the excellent service Raffles is known for delivering. As I read and researched Raffles’ development, I became eager to experience its various properties. I’ve only stayed two nights at a time in each hotel while going to meetings. To spend three or four nights and interview chefs, historians, spa directors and other specialists, as well as enjoy and soak in the services these hotels have to offer, would be the height of extraordinary luxury.